Edmonton Oilers forward Leon Draisaitl continued his astonishing season with his 27th goal on Saturday night. He vaulted into the top 10 in NHL scoring with a total of 70 points, joining teammate Connor McDavid in the upper echelon of this year’s crop. It goes without saying that the 21-year-old has emerged in his third season, even if his 51-point second season was nothing to sneeze at. And it goes without saying that Draisaitl is the real deal, even if most of the attention in Edmonton is directed elsewhere. Maybe that’s why Draisaitl has been able to produce so consistently. Maybe living in the shadow of McDavid has benefitted him. Or maybe playing on McDavid’s line has benefitted him more. Regardless of the argument, Draisaitl’s scoring has put the Oilers in an interesting position. Not only do they find themselves a playoff threat, they could put up a serious challenge for the Stanley Cup. Draisaitl finds himself in a seven-game point streak, although he’s had at least two points in six of his last seven and only snagged the one goal on Saturday to end that streak. And six multi-point games in a row is kind of a big deal, as the German forward became the first Oiler to accomplish the feat since Mark Messier way back in 1990. In 2015-2016, Draisaitl became the first Oiler since the Moose to amass at least 17 points in the first 10 games of the season. The 2014 pick has 130 points in 184 games for Edmonton and has emerged as one of many stars from his draft class, joining David Pastrnak in having a breakout year in his third year and possibly shedding light on greatness to come. The counterargument is that Draisaitl’s success has more to do with McDavid than any particular skillset in the Cologne native’s arsenal, but that’s a cynical approach. 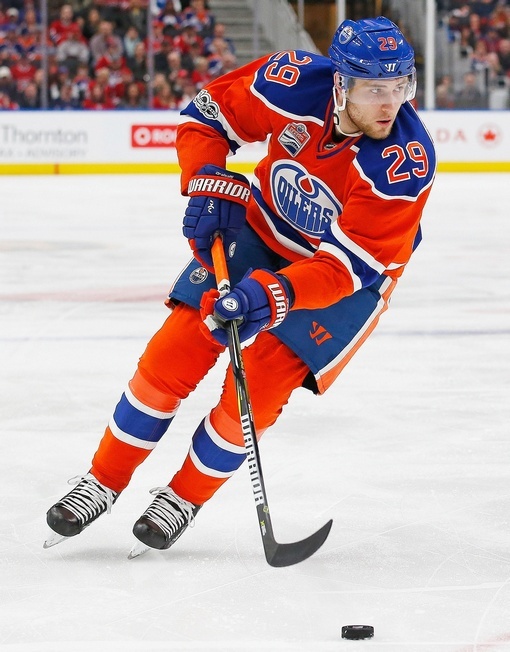 Nothing happens in a vacuum, for one, and Draisaitl boasts an impressive individual toolkit that has boosted the chemistry of his line and arguably assisted McDavid in achieving some of his remarkable success. If there’s trouble here, it could come up around contract time. Draisaitl will fetch a pretty penny, especially with a Schedule B-loaded contract. McDavid has already topped out his potential bonuses, but Draisaitl’s play means the Oilers could bust right through the salary cap ceiling. There may be some wiggle room, but not much. Few guessed that Draisaitl would surge now and fewer still guessed that he’d be the second Oiler to reach bonus territory and break on through to the other side. For now, Edmonton is at last greeted with an embarrassment of riches in the talent department. It’s a exceptional situation in a lot of ways, but it’s still a nice problem to have.